With budget graphic cards making a huge entrance this year, 2016 is the best time to get into PC gaming. After the GTX 1060, NVIDIA has recently released the cheapest of their GPUs, just a little above the 100 USD price point. The GTX 1050 and 1050 Ti seem to be a direct response to AMD’s RX 460 graphics card, aimed to be the entry level GPU for high quality gaming. Let’s start with the specs. The ZOTAC GTX 1050 Ti is about 144.8 mm in length and comes with a single 90 mm fan. One interesting thing about the card is that it doesn’t come with a 6-pin power connector, as the power supplied by the PCIe bus is more than enough for the 75 W GPU. It offers a base clock speed of 1303 MHz and a boost clock speed of 1417 MHz. When it comes to display options, the card tries to cover all the bases, providing one HDMI port, one DisplayPort 104 and one Dual Link DVI port. It can support up to 3 monitors at a maximum refresh rate of 240 MHz and maximum digital display resolution of 8k UHD (7680 x 4320). The card features a single slot bracket with no air exhaust ports, which might create issues with heating. The card’s performance is nearly silent as well, making sure there’s nothing to hinder your experience. When it comes to GPUs, benchmarks are the most important thing, and at the price point the GTX 1050 Ti comes at, it becomes even more significant. 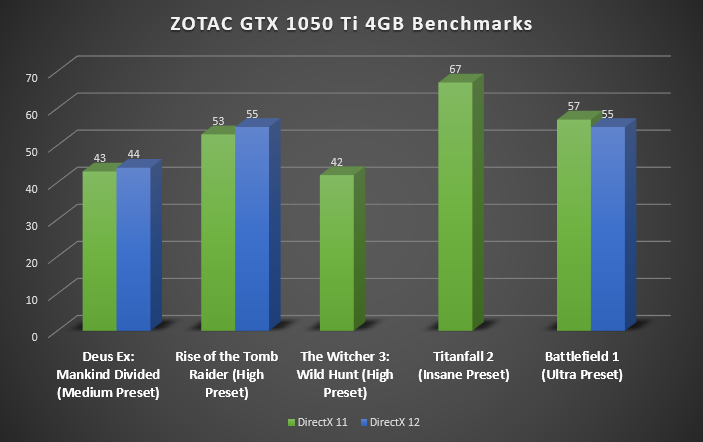 Our benchmarks for the ZOTAC GTX 1050 Ti involved realtime benchmarks, including in-game tools to test the card’s performance in Directx 12 and Directx 11 on the latest games. The first title we decided to test on the ZOTAC GTX 1050 Ti was Deus Ex: Mankind Divided. As the card isn’t aimed at running the games at ultra settings, we tried testing it on the High preset. But that wasn’t able to provide playable framerates, so we had to switch to Medium settings (anti-aliasing off). Here card performed quite well, providing an average framerate of 43 FPS on Directx 11 and 44 FPS on Directx 12. The next title in line was Rise of the Tomb Raider. Again, not running the game on ultra settings, we tested the card on the High preset with Hairworks and Anti-aliasing turned off. The GPU’s performance was more than satisfactory, with an average of 53 FPS on Directx 11 and 55 FPS on Directx 12. The Witcher 3: Wild Hunt still proves to be a strong benchmark game with its vibrant open world, and the budget range GTX 1050 Ti continued to impress us, with an average framerate of 42 FPS on the high preset, with the Hairworks and Anti-aliasing turned off for obvious reasons. To test the GPU’s prowess in titles released recently, we tested both Titanfall 2 and Battlefield 1 on the highest settings. The 1050 Ti shone brightly in both the titles, giving an average framerate of 67 FPS in Titanfall 2 on the Insane preset. A similar case was observed in the case of Battlefield 1, where the graphics card ran the game at an average of 57 FPS on Directx 11 and 55 FPS on Directx 12, on the Ultra preset. This can either mean that both the games are very well optimized to run on entry level cards, or the GTX 1050 Ti is much more powerful than we had anticipated earlier. In any case, this makes it a very good choice for someone who is looking for a cheap gaming option. All games tested on 1080p. 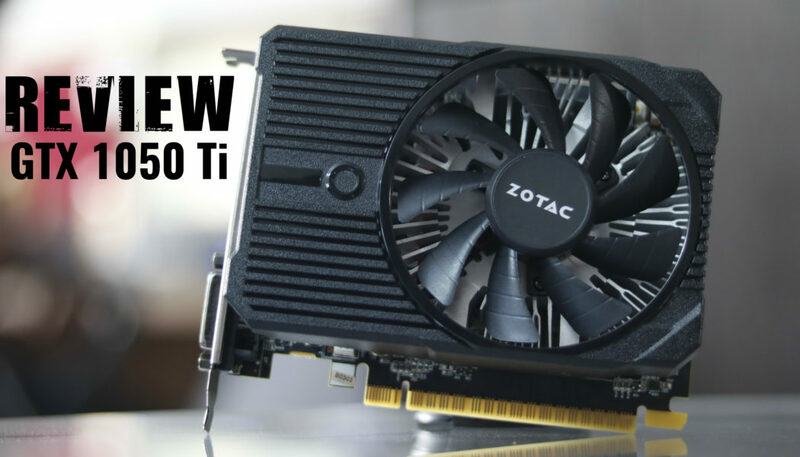 The ZOTAC GTX 1050 Ti is truly an impressive graphics card, and the performance it provides at the price tag of under INR 12000 (as given on Amazon) left us speechless. It is perfect for people looking for an entry level option into PC gaming, and will hopefully bring down the cost of gaming rigs as well, making them more affordable than ever. Bang for buck would be an understatement. However, for a longer term use you might for to save up for a GTX 1060 because that will only provide you a better experience, in addition to making your setup VR ready.